To be honest I prefer your choice, car looks more streamlined and neat. Aramid/Henry uploaded some modified skins at NoGrip years ago with spotlights on top of the hood (found them yesterday on my HD). Can/will upload these over at RaceDepartment (https://www.racedepartment.com/) when I'm at home. 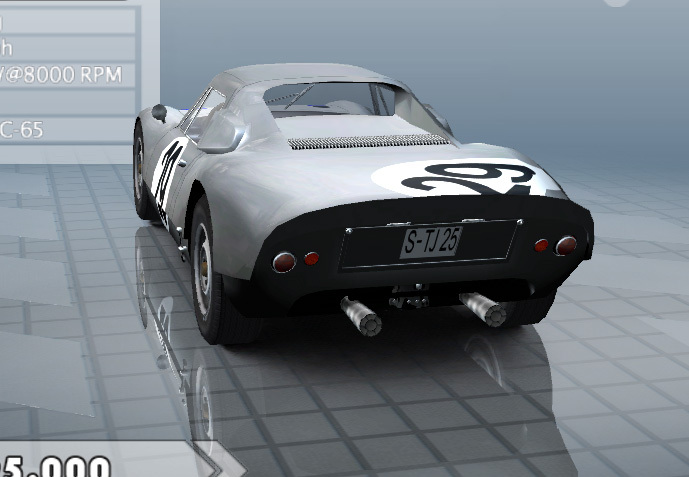 Link to both cars resized and added No plate to30, made other changes to skin tidied up door elipses. No time to test so hopefully ok.
Was just thinking: how difficult would it be to have both options for the spotlights, after all both no29 and no30 had the spots on the bonnet at Le Mans 64? Thanks jeannomiller, perhaps Muddie can use those to give us another option for those who prefer the spots on the bonnet. philrob am I losing it, this zip has the original mod and some sound files I have not seen before, but no 29 and 30? no your not losing it lol but i think i am, i will have to slow down.I will repack 2 skins and repost. Yes perfect thanks but actually your initial mistake was beneficial, there are some Spyder .wavs in there that we need, so it's all good! Sorted. After being very careful to specify the path, I then put the files in the wrong place. Dumbass. You would think a systems analyst and programmer would know better. Sheesh. Having looked more carefully at the other .aud files for the 904-4 and 904-6 I see that the spyder wavs were used for the 904-4 which makes sense, so I have used the 906-8 wavs only for the engine sounds and left the backfire and shift sounds as is. Looks a bit like an US-sized license plate? Thanks for the info regarding the homologation parameters, Offlabeluse, I was not aware that this was the case, To tell the truth I did not look up the homologation criteria, Interesting! I managed to work out that putting the .aud file in the root folder of the mod is the only way to get it to work. I was hoping the shortcut I mentioned would work (would have made the folder structure when the mod is released simpler) but it's not an obstacle. philrob I tried everything to make that picture clearer; very grainy, but I have to agree with you, it does look more like a 4. Details of the Fixing were nice. Does anyone know something? How could they do this, this bloody thugs! Thanks for all these photos and info guys, this thread is moving along nice now. The ID light seems to have been very inconsistent as an installation. I scrolled down a long way on Google images and it appears on models but not on actual cars very often. 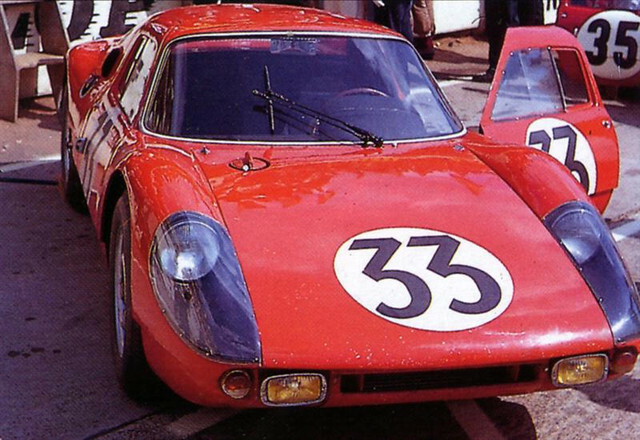 Regarding the spotlights, if its possible via the genstring (which I still don't fully understand), for me first prize would be to have all the options available but in the case of #29 and #30, have the spotlights on the bonnet because that is the way they were at Le Mans in 1964. That way, there is authenticity and convenience. Icons. Probably have to redo when the spots on the bonnet are done. 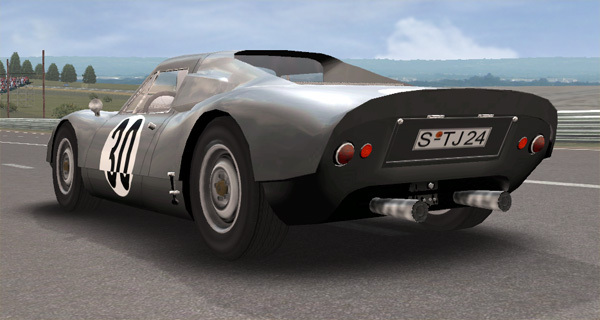 Nice to see you learning so fast Uncomman----the Porsche 904 is a perfect example of torque versus horsepower. the 904 4 cylinder has 148@ 5000, the 904-6 has 140@ 6000 and the 904-8 has 151@6700. 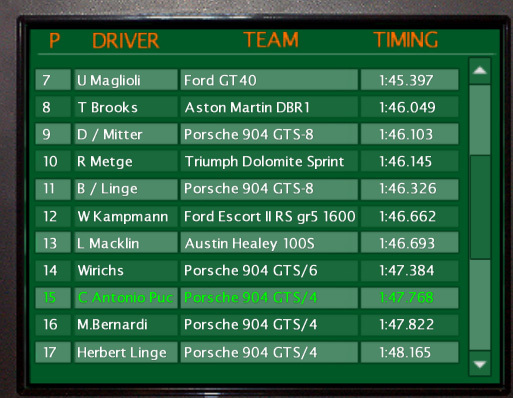 After doing the physics the 904-4 is only 1 second slower than the 904-6 and only 4 seconds slower than the 904-8 using Sebring 12H as the track. The extra weight and torque make the differences smaller than I thought they would be. I remember that I did the physics for the Ferrari 860 Monza using the 250 testa rossa as a base--the 860 has a very large 4 cylinder with huge torque in comparison to the Ferrari V12----it's a torque monster with incredible acceleration, it was faster than the testa rossa but couldn't sustain or survive over-revving in real life. A bit off-topic but I hope it's a little interesting. The 904-4 produces its torque at lower revs, so its more punchy on a track where the straights are short, and the effect is that they are all within 2 seconds of each other. I remember when I was racing, we could get close to the Ducatis by the end of the straights, but even if we competed well under brakes (difficult because their brakes were so good) and stayed with them in the turns, they just left us coming out of the bends, the combination of two big pots (Dukes were twins) and the long stroke making them impossible to stay with. My 4-cyl Kawasaki developed most of its torque and power at high revs and we made it up by the end of the straights, but they had to be long straights. In the short stuff, high torque at low revs is better.